AH Digital FX Studios has one more satisfied client, Frecker's Saddlery. 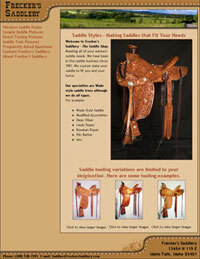 Frecker's Saddlery specializes in Wade style, custom built western saddles. Frecker's has made saddles for Tom Selleck, Buck Brannaman, Curt Pate, and many others. He has sold saddles around the globe. Kent Frecker has been in the saddle business for over 23 years and is dedicated to the saddle making profession. I have known Kent Frecker for a number of years now, and it has been a pleasure working with him. I have watched him for the past few months as he has built a number of saddles, and his craftmanship is amazing. The detail and work that he puts into each saddle is remarkable. Check out his site and look at the detailed tooling, and you will begin to get an idea of the amount of time and dedication he puts into each saddle.